Heavenly blog! : Nr. 530: It is not without reason that the Evangelist Jorn Strand have turned aside from the way of the Lord! Has he never learned to make up his sin, put it behind them and move on! Nr. 530: It is not without reason that the Evangelist Jorn Strand have turned aside from the way of the Lord! Has he never learned to make up his sin, put it behind them and move on! It is not without reason that the Evangelist Jorn Strand have turned aside from the way of the Lord! Has he never learned to make up his sin, put it behind them and move on! It is not without reason that the Evangelist Jornstrand have turned aside from the way of the Lord! He never learned to make up his sin, put it behind them and move on! 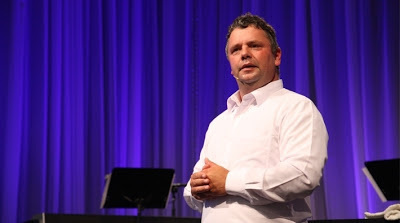 Here he is pictured Vision Norway Summer Conference in 2012. just going out to work with Jan Hanvold and Vision Norway testify that one is totally out driving on the road one goes in the spiritual realm. If one is not that Jan Hanvold is a false prophet, a liar and crook, then it is possible that it is also even, as it is obvious that Jorn Strand is. He is of the same type as Hanvold charged with a background in substance abuse and more. , I know the Beach from the time he lived in Rogaland when we lived there then. I have spoken to him and had nothing to do with him, though not much. He then preached against remarriage, which is biblically correct. But I sent an email to him and asked how he could preach against remarriage and collaborate with Jan Hanvold? The answer I got was you, curses and more strange. I realized that the man was corrupt, deceived and controlled by his own flesh. He was anything but a man of God and a true servant of the Lord. Why did Jornstrand to hit for so little? Could the answer be that he is stuck in things he will not release hold of? I write the headline: He has never really taken with sin, then put it behind them and move on! I have received information from different people who have circumvented him and his family, that he has such a checkered past with so much wonder. This he never really made up, put behind them. Therefore he behaves himself as he does (like a clown and showman). How important is it to put things behind them, make it up, and then go on with God? 12 I do not mean that I have already obtained all this, or have already become perfect, but I press toward it to grab it, because I am apprehended of Christ Jesus. When even Paul could say that he was not perfect, we can also say that. But he drove towards the goal. We are in a spiritual my marathon run most and not a 100 m How to reach the target and reach the best possible way? In Jesus we are saved and he will be the center of everything we do. We must simply live like Jesus, love like Jesus, etc. The sluttfrelsen he had no choice, it has not yet. It happens when we meet Jesus physically face to face. How important is it not to forget and forgive all that he has done. There are sometimes other people do not forget though one has asked for forgiveness. But one can manage to forget and forgive themselves so I think it is more important than what others say and think. And we reach out to meet the target, we see and move on. 14 and drives toward the goal to win the prize for which God has called me heavenward in Christ Jesus. Like being on a track sees Paul for the Christian life. Along the road there are wonderful and important experience, but the focus must not be disregarded. It is to reach the finish and the victory wreath around the head. There are no shortcuts or opportunities to cheat to reach. And it is a high calling. No one has a higher calling than Christians. We have in mind: 2 Pet.3. 13 But according to his promise we wait for new heavens and a new earth, wherein dwelleth righteousness. 15 This is how we see it, all of us who have reached maturity. And if you look differently at something, God will give you clarity even in it. We Christians will live together not only during the 1000 årsriket and then forever. But here and now. But we have come differently to our spiritual maturity and we look differently on many things. But God will provide clarity in this. 16 Let us only so far we have come, keep up the same track! But it is important to accept others but not even go back on what God has shown. It's strange when someone has seen believer baptism but rejects this and joins the State church. State church is ripe to be closed, it has surpassed itself many times. Luther was a wonder-man of God, but he lived 500 years ago and reformed much. But it is totally unbiblical that fair and ugjenfødte should belong to the same community. (End of quote). As I see it, the Jornstrand so much "junk" in his life from the past that will never come out, up and up. Therefore he behave well then, tragically. But I think there are many former drug abusers and addicts who have never been on any stand or rostrum been in God's kingdom work. Before they had made up their old sins. Acquaintance them and put them behind him. Strand has never stood up and forward as far as I know to disclose what he really has been doing before. Therefore he lives and behaves almost like a "monkey" as I have experienced it. How people scripture says we should warn, as I have done with him. And then turning in from to not be defiled! Have you made it over to these former drug users to be Evangelists and called to serve God, but has never been put into real freedom? Think about it dear friend before being captured by the same intellectual powers, then it may be too late! He should have had a team or something like that took care of former drug addicts when they have so much dregs and another in their lives that need before they can be of service to God. My experience is that most, not to say all former addicts have had so many traumas, children, and other conditions. That must be confessed, get up and forward. Before they can go out in the service of God, therefore Scripture says repeatedly that we should confess our sins, to be healed. James 5:16 Confess your faults one to another, and pray one for another, that ye may be healed A righteous man's prayer has great power in its effects. 19 Therefore, whoever breaks one of these least commandments, and shall teach men so, shall be called least in the kingdom of heaven, but whoever practices and teaches these commands will be called great in the kingdom of heaven. My experience with Jornstrand is that he is trying to be free. But the secret of being there is confession, settlement and then move on! We can not move forward until there has been a confession and past sins! Beach "hides" past sins. It is not so easy to be free, really free! Satan wants the property he once had! He is not set in freedom itself, therefore jester he has not quite control himself. He has, after all, such a checkered past with both children even before he was saved. And now married to Pernille who have been deceived just like him, and the new kids here. Then there must be trouble, until one has become free, set free himself. It is a truth one way to go also for former drug addicts, they have essentially a heavier way to go as they have been in so much sin that will affect them forever if they are not put into real freedom of the Gospel! John 8:36 If the Son sets you free, you shall be free indeed. John 8 31 Then said Jesus to those Jews which believed on him, If ye continue in my word, then are ye my disciples, 32 and you shall know the truth, and the truth shall make you free.